These sweet treats are simply irresistible and add the perfect touch of whimsy to all types of parties and backyard barbecues. Reserve 48 wafers for bun tops and bottoms. Place remaining wafers in large resealable bag. Crush into small pieces using a rolling pin. Combine wafer crumbs (about 1 1/2 cups) with powdered sugar and salt in medium bowl. Microwave morsels and milk in medium, uncovered, microwave-safe bowl on HIGH (100%) power for 45 seconds; STIR. If necessary, microwave at additional 10- to 15-second intervals, stirring just until smooth. Pour chocolate mixture into wafer mixture; stir until combined. Cool for 10 minutes. Line baking sheet with wax paper. Roll mixture into 24, 1-inch (about 1 tablespoon each) balls. Place each ball on prepared sheet; flatten slightly to form burger patties. Combine coconut, water and green food coloring in small, resealable plastic bag. Seal bag and shake to coat evenly with color. To Assemble: Place 24 wafers, rounded side down on prepared baking sheet. Top each wafer with 1 burger patty. Top each burger patty with 1 teaspoon colored coconut. Squeeze decorating gels on top of coconut. Top with remaining wafers. Brush tops of wafers with melted butter and sprinkle with sesame seeds, if desired. *A 12-ounce box of vanilla wafers contains about 88 wafers. Recipe can easily be doubled or tripled. Great birthday or slumber party activity. 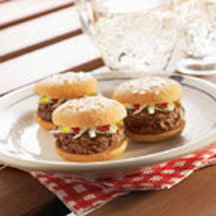 Cut apricot fruit rollups into small 1/2-inch squares to create cheese for the mini burgers.